GSMArena team, 16 September 2017. It's official, Samsung finally made the leap into the trendy dual-camera space. For some, this might be a bit overdue. Others will surely appreciate the level-headed approach the Korean giant typically has for such major steps in any direction. Regardless of how you look at it, however, this veritable Samsung first was not accompanied by fanfare. It is more of a logical step forward and a pretty safe and measured one at that. Samsung opted for a telephoto approach, much like that on the Apple iPhone 7 Plus. The Note8 has two 12MP snappers. They are not exactly created equal, which is unfortunately still a limitation in smartphones. The main camera is actually the same Dual Pixel one, as found on the Galaxy S8 and S8+. It is tried and true and very capable - f/1.7 aperture, 26mm equivalent lens and PDAF. Powered by either a SLSI_S5K2L2_FIMC_IS sensor on the Exynos model or a Sony IMX 333 in the Snapdragon one. Both with 1.4 um pixels. So, the situation is exactly identical to the S8 and S8+. That being said, anything the second camera has to offer is essentially a bonus at this point. From a hardware standpoint, it has the same 12MP resolution, f/2.4 aperture and a 52mm equivalent lens. Finding the exact sensor make and model proved to be a challenge, but it is definitely a smaller one. It is also obvious that the telephoto shooter is noticeably darker than its sibling. On a more positive note, however, both cameras have optical image stabilization - a first in the smartphone realm. Although, we should note that Apple isn't really lagging behind in this area, with the recently announced iPhone X sporting identical stabilization. OIS is a really nice touch, especially on a darker camera. It should allow it to shoot at lower speeds in bad lighting condition and gather more light, while remaining confident in its ability to correct small camera shakes and jitters. However, it has its issues. More like inherent shortcomings, to be fair. For one, the telephoto snapper does not have a Dual Pixel sensor. There has been some confusion on the matter, likely due to Samsung's less than careful wording at the announcement event. In any case, the end result is noticeably slower focus when shooting with the narrower camera. It still has autofocus, but it is a lot less advanced. However, we are getting a bit ahead of ourselves and this might sound overly harsh on the secondary camera, which shouldn't be the case. 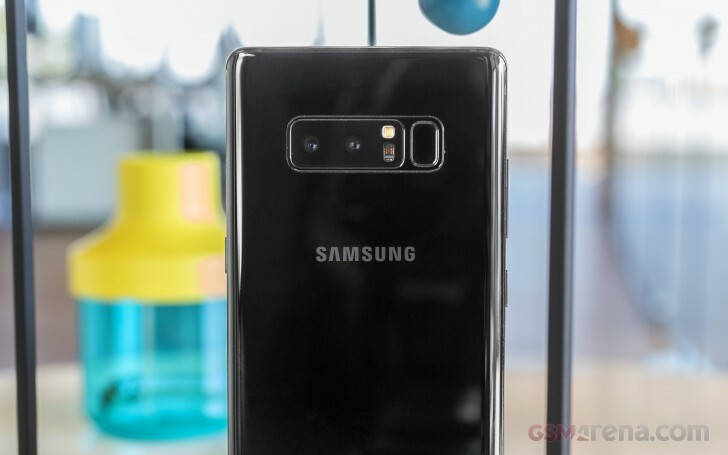 For most users, it will likely be recognized as the hardware that powers Samsung's new and pretty impressive Live focus portrait mode, rather than a zoom lens. You are more than likely to use the secondary camera in this supplementary role and rely heavily on the main 26mm one instead. In fact, OIS or not, the Note8 actually forces you to use it instead of the 52mm one once the light drops below a certain point. The main camera is also necessary to take advantage of Samsung's smart image stacking for improved still quality. We still believe this aspect is the biggest camera innovation to debut with the S8 pair. Officially called "Multi-Frame Image Processing", it is similar to the HDR+ on Google's Pixel XL - a phone widely praised for its camera prowess. Unlike the latter, however it does not require a toggle on the Note8 and simply works seamlessly in the background. We are still not exactly sure how the feature works under the hood, but from what we can gather, after launching the camera, the device starts taking photos continuously in a burst buffer. Then, as you press the stutter it picks out the last 10 or so taken at this moment and blends them together, trying to pick up as much detail and produce an image as clear as possible. Typically, this involves pixel by pixel comparisons to isolate noise and other undesired artifacts and to gauge sharpness and all this is done in the background. To be fair, if you start hitting the shutter button quickly, you will notice a few delays between shots, from time to time. Still, the user experience is perfectly tolerable. First of all, there is no dedicated video recording UI. This shouldn't really be an issue for most real-world scenarios, but precisely framing is immensely more difficult without seeing the proper viewfinder before you start recording. Also, the interface is arguably busy as a whole. It even has notification badges for new content. However, that is nitpicking, especially since Samsung does have an abundance of powerful features it has to fit inside the UI. We do have to note that the constant sticker shortcut, we found incredibly annoying on the S8 pair is no longer there. Since the Note8 is a more serious device by design, it is good to know that there will be no Bear hat icon on the viewfinder at all times like it is on the S8. However, that is not to say the stickers are gone. Not in the least bit. In fact, stickers, stamps and filters are more than ever now. Things are now organized into two big categories - filters and stickers. Filters are further sub-categorized in two categories. There is plenty to choose from and a download interface to get even more. Stickers are where things start to get a little out of hand. There are three categories here. We'll start from the last one, since it is the simplest - stamps. They are all black and white and use some impressive typography. They also come with convenient controls for move, resize and even rotate. Actually, we have to admit, these are quite cool. The other two categories house dynamic overlay effects. Samsung already had plenty of those in the S8, but now there are way too many to easily navigate. The two sub-categories do help some, in the sense that the "hat" category seems to have more toned-down options. If you want to look like a seal with "kawai" eyes, look in the other category. Face tracking is good, but not great, though. If you inexplicably find yourself in a shortage of such overlays, there are more to download. Other notable changes in the camera UI include the absence of a quick shortcut to portrait and selfie effects. Those are still present, just not on the main interface. Bixby vision has a new tab control in the revamped interface. It is now a tap, rather than an icon. The Note8 comes with a few extra camera modes. All of them are pretty self-explanatory. You can download more as well. Pro mode is really impressive. It is full-featured and offers varied granular controls at your disposal - ISO, white balance, shutter speed, exposure compensation and even options for metering and manual focus with focus peaking. You name it, it's there. You might notice that the Selective focus feature is now absent from the mode menu. It is actually gone altogether, replaced by what Samsung calls Live Focus. It is powered by the new dual-camera setup and offers adjustment for the effect both before and after taking the shot. Having data from two cameras definitely makes for a more convincing end result. Although the odd strain of hair does get blurred out on occasion.